A blend of yeast nutrients and energising salts to promote rapid fermentation. 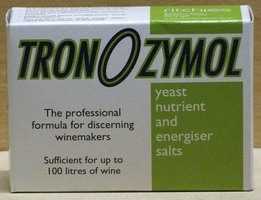 A blend of yeast nutrients and energising salts to promote rapid fermentation in home made or country style wines. Sufficient to treat up to 100 litres of wine.